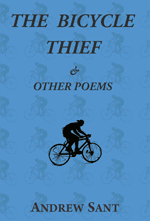 It’s no current reference, but reading Andrew Sant’s recent collection, The Bicycle Thief, Andrew McGahan’s Praise springs to mind. When I studied McGahan’s novel, a more astute student than I pointed out that Gordon’s only romantic relationship was with his car, and that, accordingly, his only romantic response was towards the sad demise of that Holden. His relationship with Cynthia (who he develops a relationship with) was conversely defined by emotional inertia and moral detachment. This observation struck me as highly sophisticated. It did not endorse a clichéd view of Australian men and their cars, rather it subtly suggested a masculine romance for an idyll of mobility. One of Sant’s great gifts is this ability to wed naturalness with thematic abstraction. The allusion to a kernel of the poetic form – metaphor, language in movement – is light and unburdened, and always keening to the particular rather than the general truth. There’s a lovely unreliable charm here that is consistent with the collection’s allergy to seriousness, even as the task of personal reconstruction invites unflinching rigour. The playfulness applied to these undertakings is underscored by Sant’s subtle half rhyme, which appears throughout the poem: ‘Number plate/ 177 EMG. It was code// to enter the quick, slow/ everlasting story of British roads.’ Yet the poem is no folly. The tone is often self-deprecating but the method is attentive and thoughtful: ‘Skip some years – the panic attacks/ in traffic jams. This/ is an accelerated, partial history.’ Charting a life through this conceit is fruitful and constructive, illuminating the speaker’s impatience with stasis as the verse careens from one vehicle to the next. and the money – with my best wishes. The gesture of good will here is earnestly made, signifying a transmission of romance – a young man’s wild dreams – across generations. This is characteristic Sant – warmly welcoming his reader to the mischief. The Bicycle Thief presents Sant’s delight with the possibilities of language in transit, language as vehicle. This is poetry for lending, sharing, travelling – this collection wants to move. This entry was posted in BOOK REVIEWS and tagged Andrew Sant, Lucy Van. Bookmark the permalink. Lucy Van is a researcher at the University of Melbourne and short reviews editor at Cordite Poetry Review. Figures, her spoken word collaboration with Laila Sakini, is out through Purely Physical (UK).